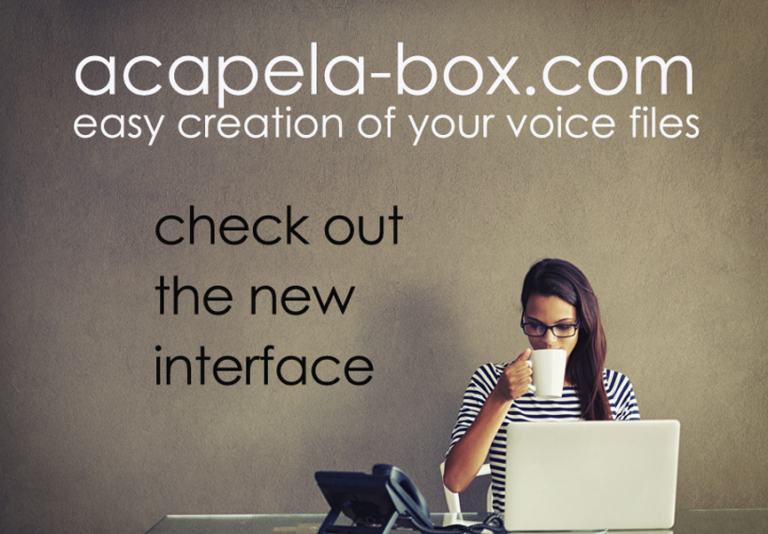 We have launched a new version of Acapela-box.com , the online service that enables you to produce voice files effortlessly. In 2014 Acapela-box attracted customers from over 116 countries and more than 5 million characters were converted into speech. Acapela-box allows you to easily create your all-rights included voice messages with your own texts vocalized with one of our voices. This flexible solution for vocalizing text is helping to voice-empower E-learning, videos, presentations, answering machines, blogs, websites, IVR, animation, mp3 players, etc. This new version includes the latest voices from Acapela Group: English US Sharon, French Manon, Scottish Rhona and our authentic bilingual voices (English/Spanish) Emilio and Valeria. 2 – Type in your messages and hear the audio result. Fine tune or modify. Test with different voices. 3 – Credit your account with 5 euros (715 characters, about 47 seconds of audio time) to 500 euros.